Even when the weather is chilly there isn't any reason not to get outside and explore all of the great parks and recreation activities that you can find in Fairfax County, Virginia. Though your week may include commuting on crowded interstates, metro rides or slug lines, the weekend gives you the perfect opportunity to take in the solitude of many of our areas parks. Whether you are looking for one of the parks run by the Northern Virginia Regional Park Authority, the National Park Service or the Department of the Interior you can find a park and outdoor activity to enjoy. Three major parks on the Mason Neck Peninsula are a perfect example of both the variety of parks and the cooperation of nature conservation groups in Fairfax County. The Mason Neck area traces its history back to 1608 when it was recording by John Smith that he meet with the native Dogue Indians and charted the local area. When George Mason, author of the Virginia Declaration of Rights built his home in the area in 1755 the name was changed from Doeg Neck to Mason's Neck. For most of the 1800's and early into the 1900's the area was used for logging of the native hardwoods and much of the land was ripe for development due to its waterfront location. The discovery of a pair of nesting bald eagles in 1965 put a halt to most of the planned development of the area and instead a committee was formed of local citizens to purchase some of the land that now makes up the Mason Neck State Park. Eventually local, state and federal agencies stepped up with funds and over 2000 acres were set aside as both a Wildlife Refugee and State Park. The park is a National Wildlife Refuge and when you stop by the visitors center you will learn more about the variety of birds, including the bald eagles that you will find througout the area. The playground overlooking the water is a treat for children, there is a 3 mile bike path through the woods and plenty of trails to explore. Just down the road is Pohick Regional Park run by the Northern Virginia Park Authority. This park is one of only three Northern Virginia public access points for the Potomac River. If a power boats aren't your thing then you can rent a canoe, kayak or paddle boat and head down one of the quiet tributaries off of the river. Pohick Park is a full service park with no only the boat launch facilities but also an 18 hole golf course, a miniature golf course, playground and numerous picnic areas. Pohick Park is one of the few local parks that has rustic cabins available for rent as well as campgrounds for tent campers. As part of the Northern Virginia Regional Park Authority residents of the county can also buy annual pool passes which can be used at any of the other NVRPA pools in the summer as well. The park shelters an abundance of wildlife, including bald eagles. As you are wandering through the numerous paths in the park you can expect to see osprey, heron, deer, beavers and occasional a rare view of a river otters. The last park on the Mason Neck Peninsula you may want to spend some time in is the Meadowood Recreation Center run by the Department of the Interior, Bureau of Land Management. The 800 acre site has numerous well marked trails for hikers to follow throughout the area. Also on this site of a wild horse and burro rescue and adoption facility. Based on the number of free range wild horses or burros that the Department of the Interior captures in any year some are brought to the Meadowood facility and are put up for adoption. Adoption requires that families meet stringent requirements and one year after the wild horse has been adopted and certified by a veterinarian to have been well cared for you will receive official "title" to your horse. This is quick tour of one set of parks that you can find in Fairfax County, Virginia. 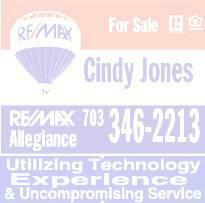 If you are moving to Northern Virginia and would like to learn more about the area, give me a call. As a native of the area I can give you a tour not only a new place to call home but other areas of interest for you and your family. All of these parks are off Gunston Road in Fairfax County. To reach them take I95 S, exit 163 to Lorton. Left onto Lorton Rd at the end of exit ramp. Go under second overpass and turn right onto Lorton Market St. Go about 1.5 mile to traffic light at RT. 1. Go straight through light (road name changes to Gunston Rd) and you will see the various park directional signs on Gunston Road. I'm sitting at my desk looking out the window at a battleship gray sky and wishing for a warm sunny day to check out parks! It was cold a crisp this weekend wandering around the parks. A couple of the Mason Neck trails were fairly packed with other cold weather fans. Today doesn't look like a day that would inspire any of us to get out of fuzzy slippers! Really good job on this Cindy. Love the pics and the donkeys. Hi Cindy, This is a great blog with lots of useful information. I enjoyed reading about it. As long as you bundle up, winter is a wonderful time to enjoy area parks. An no crowds! Christina-When I was at the adoption facility yesterday all of the horses were wearing their blankets. But at least they are being fed and taken care of. Vicki-I love the parks in the winter. You see so many different things that are overlooked when you are pushed by the crowds in the summer. Cindy~What a great mix of parks in your area. Pohick Regional Park looks to be a great place to hang out for the day and it offers so much for everybody. Thank YOU for sharing your beautiful parks with us. Beautiful pictures. I really love your part of the country!! Cindy ~ I think it's wonderful that there are so many parks to visit in your area. They probably make a great de-stressor after a busy week of work, commuting and life in general. I think it is interesting. We used to see signs - "Don't Fairfax Loudoun". Well, I look around, and to me it looks like Fairfax has done a pretty good job. Lots of parks, lots of jobs, a pretty darn good police department. Julie-thanks for wandering by. Pohick is great for the entire family to enjoy and when the weather is warmer I'll be launching the kayak. Martin-remember if you come to visit you have to call! Kevin-fortunately there are a few places that the developers didn't get to. Cindy - Looks like a great park. The wild burros remind me of the ones we had in Big Bear, California that used to wander through the neighborhoods of this mountain community, and gnaw on the side of my house! That herd wandered free, though, mostly on the outskirts of town. Good luck in the contest. Very informative post. Love the donkey picture!